This is a Christmas gift for my 7 year old great-niece. Ever since we took her to see the documentary “Eight Days a Week” she has been a massive Beatles fan, and loves Macca in particular. I had promised her she would see Paul this past summer, but illness prevented me from doing so. I wanted a gift that would commemorate those shows and it comes with a promise that she WILL see Paul live. It’s a mission for me. This blanket just blew me away! It is absolutely stunning, and something every fan would be proud to own. So well made, beautiful colours and rendition of Paul. 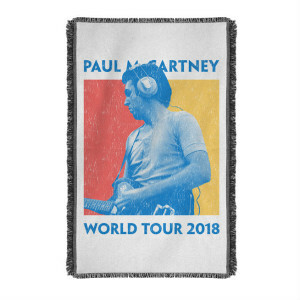 If you’re looking for a keepsake that will last a lifetime that you’ll be SO proud to own, I highly recommend this blanket. It is PERFECT! !